Little Falls Granite Works, 24 East Broadway, Little Falls, MN, c. 1917 or 1918. Donated to MCHS Collections by John Karlson, son of G.W. Karlson, founder of the Little Falls Granite Works in 1911. 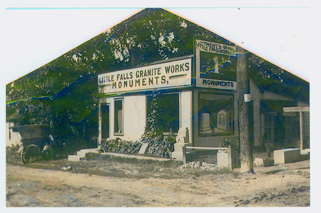 The Little Falls Granite Works was founded in 1911, which makes 2011 its 100th anniversary. This fact, which seems like it would be hard and fast, has been debated through the years. 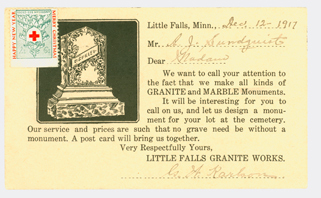 Because a business with a similar name, the Little Falls Granite Company, was formed in 1897, some assumed that this was the beginning of the Little Falls Granite Works. Futher confusing the matter was the Little Falls Granite and Marble Works, which was in existence in 1907/08. A careful examination of the historical record and information from Harriet Karlson, daughter-in-law of founder G.W. Karlson, made the origins of the 100-year-old Little Falls Granite Works clear. And there you have it, 100 years of shifting locations, owners, and slippery dates of the Little Falls Granite Works. This article originally appeared in the Morrison County Historical Society newsletter, Volume 24, Number 2, 2011. Little Falls Granite Works postcard, front, addressed to A.J. Sundquist from G.W. Karlson, December 12, 1917. 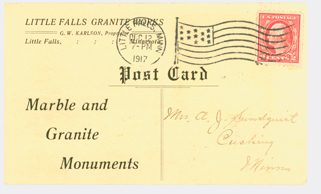 Little Falls Granite Works postcard, back, addressed to A.J. Sundquist from G.W. Karlson, December 12, 1917.